New Jersey was the proud host of the 2014 Special Olympics USA Games. It was at those Games, the largest USA Games in our history, that the sport of triathlon was introduced as a Special Olympics event. This historic event showcased awe-inspiring displays of courage, bravery and determination, leaving a legacy for Special Olympics New Jersey to carry on. In September 2012, Eneractive Solutions, LLC, an energy consulting firm hosted the inaugural One More Tri to benefit Special Olympics New Jersey. Acting on their belief that it is their corporate responsibility to give back to the community, the Eneractive team developed a seamless event from scratch. This unique race started the One More Tri tradition of offering Special Olympics athletes and typical athletes the opportunity to compete together. Triathlon was introduced as a Special Olympics demonstration sport at the 2014 Special Olympics USA Games, held in central New Jersey. Thanks to the dedication of coaches Lisa Rumer and Carrie Merrit, 16 Special Olympics New Jersey athletes embraced the sport and competed for the first time at the USA Games. Several Special Olympics New Jersey athletes medaled in their divisions, and New Jersey clenched the overall gold for both the men’s and women’s races. 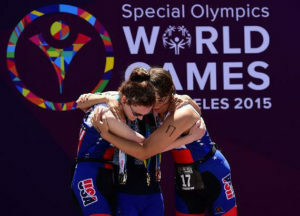 For the first time in Special Olympics history, triathlon was contested on the international stage at the Special Olympics World Summer Games in Los Angeles. The debut event was part of the Unified Triathlon Experience, joining 19 Special Olympics athletes from around the world alongside elite triathletes, celebrities and multisport fans. Four Special Olympics athletes, all from New Jersey, qualified to represent the United States. Noah Dellas won the men’s race, Amy Noctor and Courtney Dreyfus received the silver and bronze respectively for the women, and Ben Heitmeyer earned gold in his division. The 2015 One More Tri marked the first officially sanctioned Special Olympics triathlon to be held in the state. This race provided the platform for Special Olympics New Jersey athletes and Unified partners to compete as individuals or on relay teams for Special Olympics New Jersey medal. At this historic event, 13 individual athletes, 5 Unified relays (2 athletes and 1 Unified partner) and 4 individual athletes from Special Olympics Virginia raced shoulder to shoulder with the One More Tri competitiors. Together, more than 700 athletes, volunteers and sponsors rose before the sun for our 5th anniversary One More Tri. The choppy ocean waters resulted in a shortened, yet extremely challenging swim course. Shoulder to shoulder to shoulder, triathletes with and without disabilities battled the waves, biked and ran…and showed us all what athleticism, perseverance, and grit looks like. Plus, 43 Special Olympics athletes and Unified partners raced as peers among the 317 triathletes who competed. What a beautiful event to witness!